Communications in Mathematics — ISSN 1804-1388 (Print), ISSN 2336-1298 (Online) — is a continuation of the journals Acta Mathematica et Informatica Universitatis Ostraviensis, founded in 1993 (ISSN 1211-4774), and Acta Mathematica Universitatis Ostraviensis (2003–2009, ISSN 1214-8148). It is published by University of Ostrava, Czech Republic. We are a member of Sciendo (formerly De Gruyter Open). 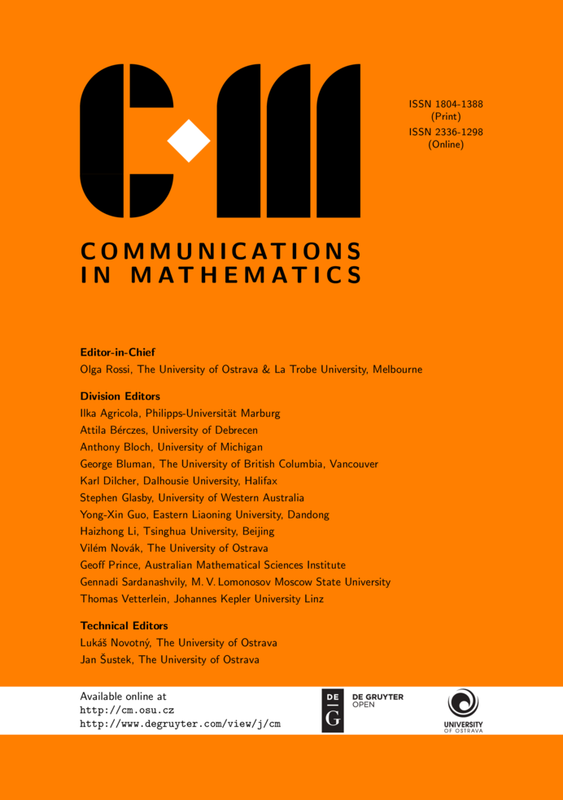 Communications in Mathematics publishes research and survey papers in all areas of pure and applied mathematics. To be acceptable for publication, the paper must be significant, original and correct. High quality review papers of interest to a wide range of scientists in mathematics and its applications are equally welcome. The journal is reviewed in Mathematical Reviews and Zentralblatt MATH and indexed in Scopus.